This salad pairs ripe tomatoes with nutty-tasting farro (a kind of wheat), but you can substitute barley. 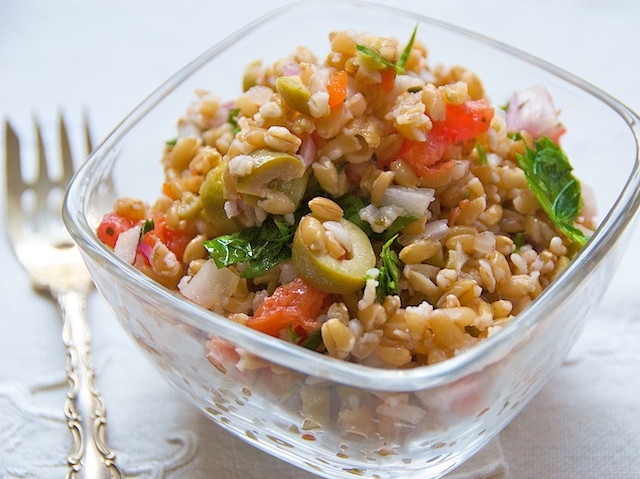 Like most starches, grain salads are easily manipulated to meet the needs of the occasion. Sprinkle feta cheese over the salad to make it more substantial, or top it with thin wedges of a semisoft sheep’s milk cheese. The flavors of grain, tomato, and green olive also pair well with grilled poultry and lamb. For vegans, serve the salad as an accompaniment to roasted cauliflower and romesco, the Catalonian sauce made from peppers, nuts, and roasted garlic. Put the farro, ¾ tsp. sea salt, and the bay leaf in a 3-quart, heavy-bottomed pot and add 6 cups of water. Bring to a boil over high heat, then turn down to a simmer. Simmer, partially covered, for 25 to 35 minutes, or until the grain is tender but still offering some resistance to the tooth. Drain, then spread the farro out on a sheet pan to cool. Remove bay leaf. Once the farro has cooled, mix with the remaining ingredients in a large bowl. Serve at room temperature. Read more in Kelly Myers' Front Burner article on the pleasures of cooking with summer tomatoes.